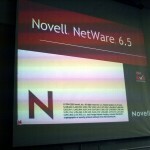 See also the Novell Application Note The NetWare Internal Debugger. There’s more good information in the Novell TID 3193476: How to troubleshoot … an abended, unresponsive or crashed server. Need a Netware System Administrator? This article was inspired by Debian Administration: The magic sysreq options introduced. Novell Class by mafketel used under a CC BY-NC 2.0 license.